If you’re a team at Hack&Roll, or if you’re planning on just dropping by, here’s a participant briefing document that we’ve prepared so you know what to expect at the event. 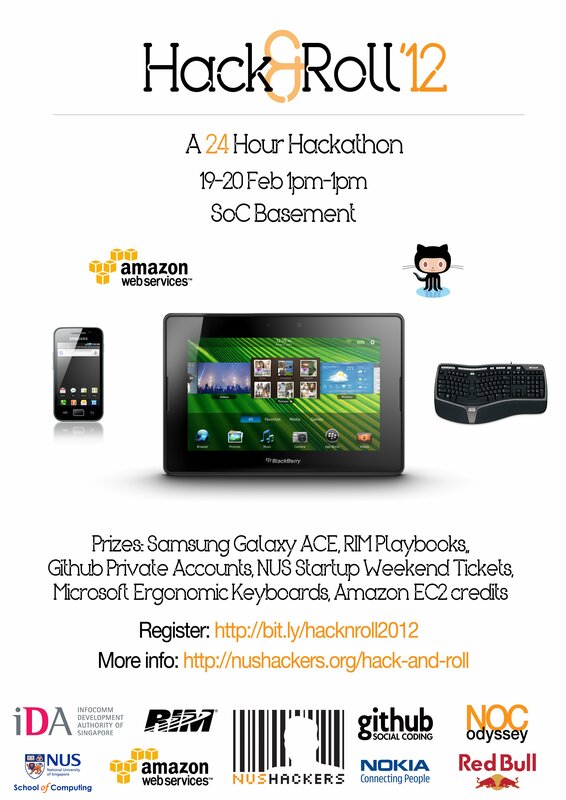 You may follow the event on Twitter, Facebook and Google+, or follow the official hashtag: #hacknroll, on Twitter. Participants will be getting Blackberry Door Gifts, and $25 AWS credits. If you’re not participating, you’re still welcomed to drop by and code - and enjoy the free food and caffeine! See you at COM1 Basement tomorrow at 1pm (to Monday 1pm). Non participants may drop in at any time!